Everyone knows that not everybody is perfect, and that's the same in the animal kingdom too. Sometimes little cats and dogs don't act the same or don't look how we all would expect, but even so, they deserve love like everyone else. Unfortunately, due to medical bills or just not looking 'cute' enough, a lot of disabled animals won't be adopted, but here is a story of some who were. These ten cats are far from perfect to most people, but to the people who adopted them, they've become the perfect family members. Enjoy and be safe, just like BUB. This pretty kitty is special because she only has three legs. She was found in some woods with her head stuck in a bag and one of her legs in a very bad way. Unfortunately, her experiences had made her very scared and hard to get close to, but even though the shelter thought she would never find a home, the day her new dad walked into the shelter he knew he had to take her home. Poor Orren was rescued along with 150 other endangered animals but stuck out as a special case because of his super heavy breathing. After being looked over by the vet it was found that Orren had cauliflower ear, ear and nose drainage, respiratory issues, and even a heart murmur. Anyone would think that this sickly cat would never find a family, but the shelter knew just who to call and Orren was adopted in no time. Almost everyone either knows of has heard of this cat-celebrity, Grumpy Cat. What a lot of people don't know about her, however, is that this cat was one of the many 'unadoptable' shelter cats, just because of her looks. 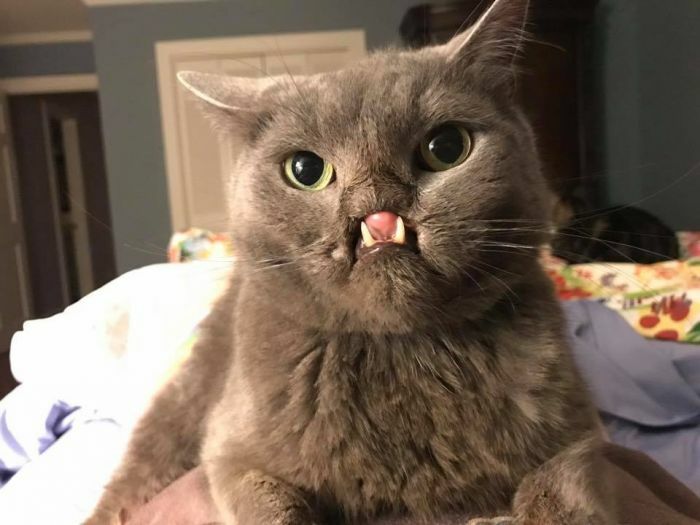 Grumpy Cat has an underbite but also feline dwarfism but even though has won the hearts of her new family, and the internet. When he was found Dexter was extremely malnourished and living with around 100 other cats. Despite being rescued and treated back to health, poor Dexter is an older cat, and along with black cats, there's proof that older cats are less likely to be adopted from a shelter. Hope was low for Dexter. Luckily for him, a loving family decided he was just what they needed, and adopted him despite his age just to enjoy his company and love for the rest of his years. Ralphee has a neurological condition that affects the way he walks. Most people would just laugh at the little fellow but one kind family decided to give him a loving home, and now she lives happily with his doggy brother, Max. Wake up, sleepy head, it's #Caturday already! Oskar is a little kitty who was born blind but otherwise is just like any other cat. He loves to eat, play, sleep, and be loved by his family, who found him on a farm when he was a baby and decided to keep him. Ms.Kitty was adopted into her forever home after being found on a golf course with an infection on her nose. After being taken to the vet they discovered this infection was actually skin cancer! They operated on her twice to finally have the cancer removed, but afterward, she had to be kept inside. The hospital kept her warm and safe until someone fell in love with her and took her home. Little Monty has chromosomal abnormalities that made his nose grow flat and his eyes seem very far apart. His strange looks could have meant he would never have been adopted but his owner loves his imperfections just as much as they love his cuddles. Lazarus was found in poor condition in Johnson City, TN, but even with his cleft pallet and no quite normal appearance, he is still just as loved as any other cat. Cats who have been rescued from shelters or the street have a better understanding of the human love they receive. Some cats though, just have no idea and go crazy! Check out these kooky cats who constantly overreact to everything.